/ » ETF » What is the right benchmark for funds owning US equities? What is the right benchmark for funds owning US equities? Some funds, the Parag Parikh Long Term Equity, for example, have a carve out for international (primarily US) equities. From a tax perspective, if a fund owns at least 65% of its portfolio in Indian stocks, it is treated as “Indian Equity Fund” for taxation – 15% short-term gains and 10% long-term gains (if held beyond one year). Otherwise, short-term gains (if held for less than 3-years) are added to your income and taxed at your marginal rate. So there is some advantage in packaging US stocks inside a an Indian equity fund. However, what is the appropriate benchmark in this case? The PP-LTE Fund benchmarks against the NIFTY 500 TR index. But based on its portfolio, it should ideally be benchmarked against a 65/35 Indian Midcap/US Large Cap index. 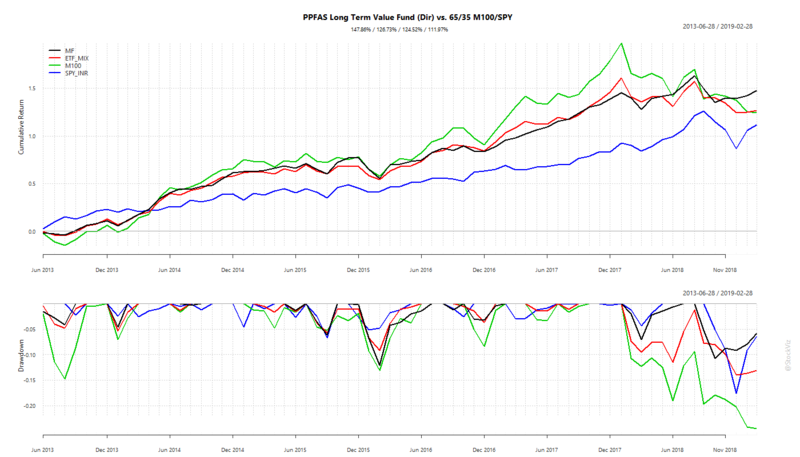 If you construct an Index with the M100 ETF making 65% of the portfolio and the rest allocated to the SPY ETF (tracking the S&P 500 index,) you will get an idea of the fund’s alpha/excess returns. If you rebalance the 65/35 monthly, the LTE Fund’s annualized returns are 16.47% (Reg.) and 17.10% (Dir.) vs. the 65/35’s 15.30%. That’s excess returns of 1.8% for the direct plan, delivered to investors in a tax efficient manner, after all costs have been factored in. Another way to look at this is that even if the present management is replaced and investors do not have faith in the new one, they can just replace the fund with two ETFs and get almost to the same place.